Photograph courtesy Tom Sutch. 5091 at Springs Branch on November 1st 1973. The gangway doors are still in place, the fuel & water tanks are of the shortened type and blanking plates cover the boiler room grilles. 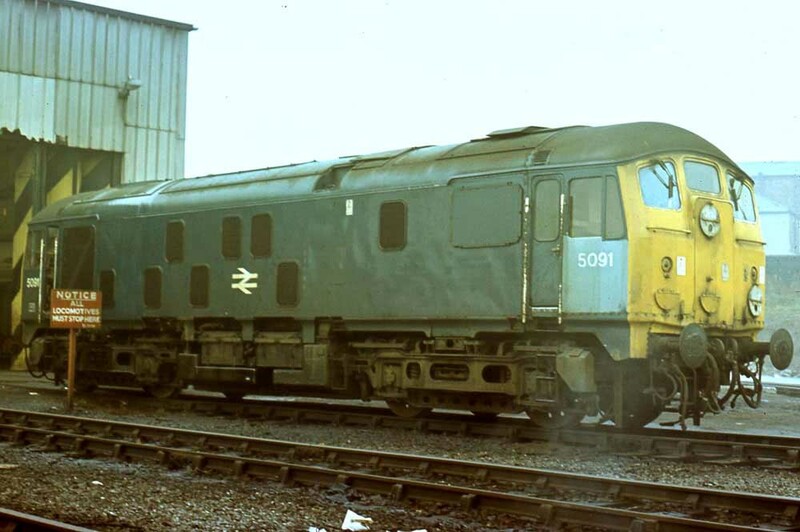 The seventeen year four month career of D5091/24091 saw allocations to Eastern Region & London Midland Region depots. Shortened fuel tank & full size water tank (shortened fuel tank fitted later). Boiler water tank removed (1975). Cabroof ventilators missing (No.1 cab only, after 1975). September 1964 to Willesden (1A). December 1966 to Longsight (9A). March 1967 to London Division (D01). October 16th 1977 to store unserviceable. November 20th 1977 - withdrawn. 24091 was stored at Crewe from October 1977 until May 11th 1978 when it was moved to Doncaster Works and scrapped there during June 1978. Movement: 24036/57/80/91 12.30 Crewe - Doncaster via Derby May 11 1978 (layover at Derby) Class 47 powered. Noted Derby Works October 1960. Noted Derby Works June 1961. Noted Derby Works April 1962. Noted Derby Works February & May (ex-works) 1962. 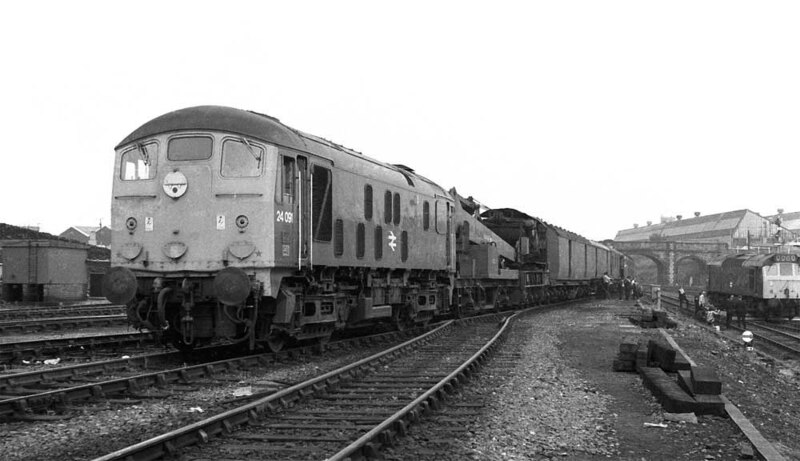 Noted Derby Works November 1966. Noted Derby Works August 1967. Noted Derby Works June 1975. Buxton depot received D5091, D5135 & D5137 for crew training and banking duties at Peak Forest at the end of February. These machines would work alongside the small pool of Class 25s working the Northwich - Tunstead ICI block trains. May 1973: gangway doors still in place, in blue/yellow livery. On May 6th a notable stranger at Kings Lynn was 24091 coupled to 25267, the pair having arrived from March to work a special freight to Bristol. On August 22nd the 13.20 Holyhead - Euston suffered a failure with its Class 47, 24091 dragged everything forward to Crewe (?). Photograph courtesy Steve Morris. 24091 at Holyhead during 1976 coming to the rescue of a derailed Class 25. At the last Works repair the gangway doors were sheeted over, the boiler water tank removed and the bodyside valencing is gone. The No.1 end cab no longer has the roof ventilators above the cab door. On July 15th 25156 & 24091 were noted together at Crewe depot, the next day (16th) they worked the 09.40 Euston - Aberystwyth forward from Shrewsbury. 24091 was noted northbound through Macclesfield on July 22nd. 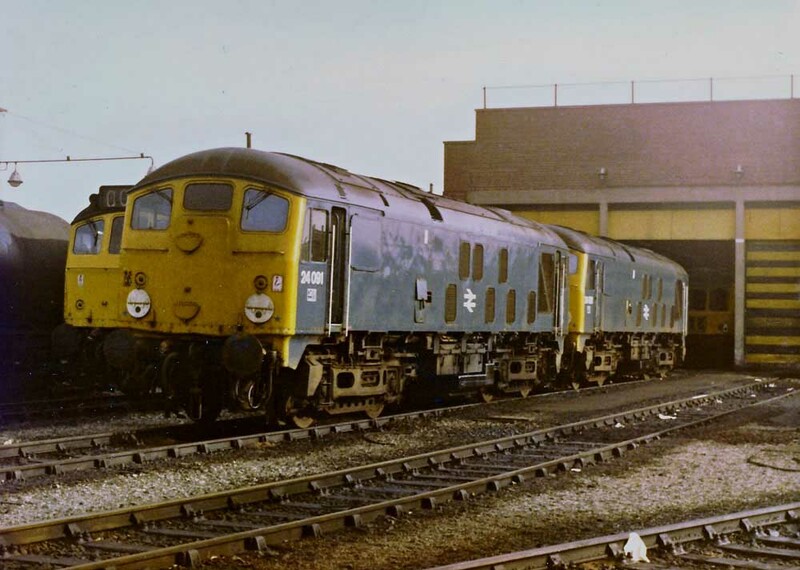 24091 & 25076 were noted northbound through Crewe station on January 23rd, possibly with loaded sand wagons. 24081 & 24091 worked an overnight Trentham - Shotwick and Shotwick - Pratts Sidings freights on March 8th/9th. On June 9th 24091 worked sand empties to Oakamoor. Photograph courtesy Steve Harrison. 24091, 24081 & 25288 at Chester on October 7th 1977. 24091 has about a month left in service. 24091 was withdrawn on November 20th 1977. Page added May 7th 2016. Last updated April 13th 2019.